This Brief provides a comprehensive overview of Cyclospora cayetanensis , a protozoan apicomplexan parasite that leads to outbreaks of traveler's diarrhea in consumers. The main characteristics of Cyclospora cayetanensis infection are covered, including documented outbreaks, regional patterns and statistics. Various transmission routes for this parasite are outlined, with a focus on foodborne transmission. A major focus of Cyclospora Cayetanensis As A Foodborne Pathogen is the detection of Cyclospora cayetanensis in different food matrices. Decontamination procedures for the occurrence of this parasite in all major food types are outlined in detail, as well as current risk assessment procedures and regulations. The difficulty in minimizing the risk of infection in fresh produce is covered, plus potential solutions for this problem. 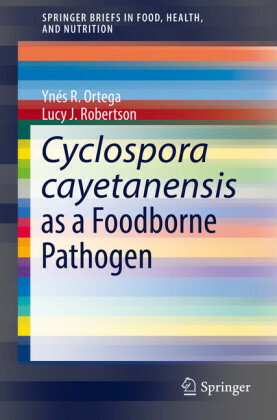 This Brief not only comprehensively covers the current state of foodborne Cyclospora cayetanensis but also looks to future challenges in the detection, prevention and removal of this parasite in foods. Ynes Ortega is an Associate Professor at the Center for Food Safety at University of Georgia in Griffin, GA. Lucy Robertson is a Professor at Norwegian University of Life Sciences in Oslo, Norway.